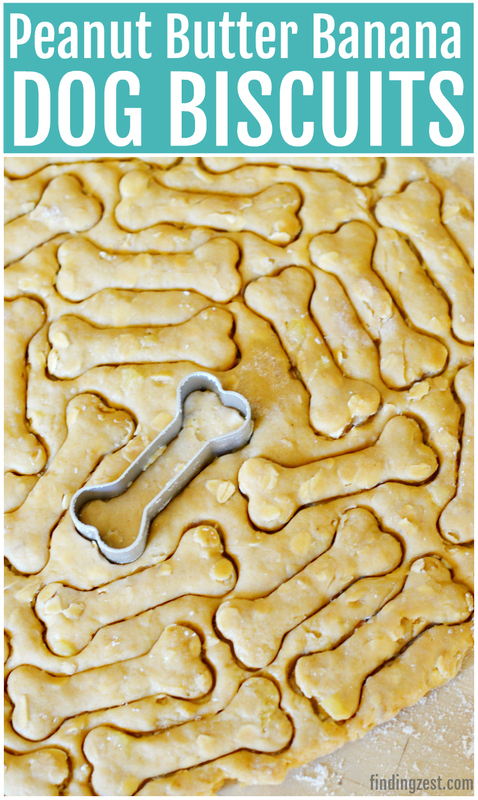 Thank you to HarperCollins for sponsoring today’s dog biscuit recipe post. All thoughts are my own. The summer has flown by and I’ve been trying to make the most of these last few weeks with my kids before they go back to school. Wesley will be headed to first grade this year and he is pretty pumped it. It is amazing to watch the progress he made last year, especially with reading. We often read books together and each take turns reading a page or a specific character. 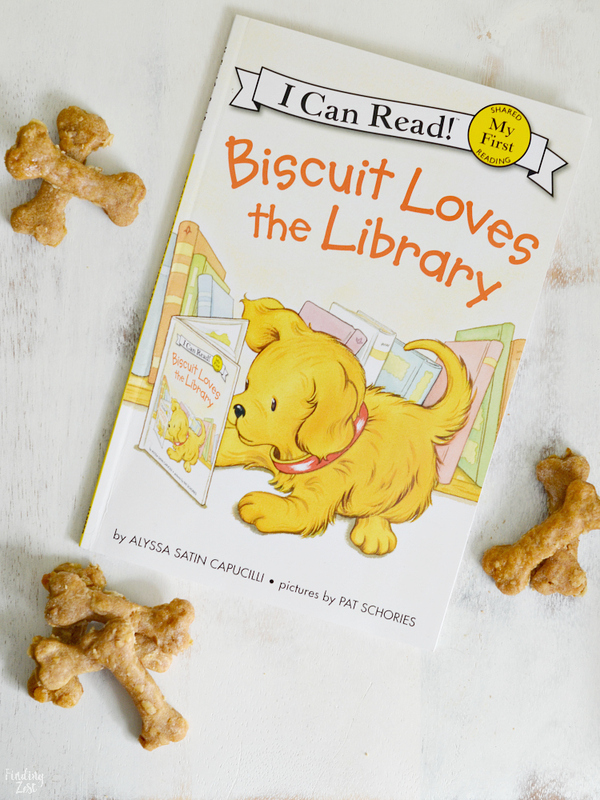 That’s why we were so happy to see Biscuit featured in our new collection of I Can Read! brand books! 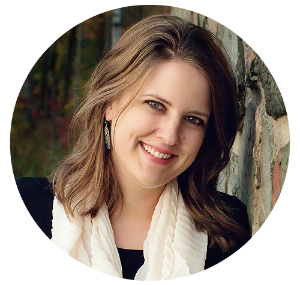 If you aren’t already familiar with this line of beginning readers, I Can Read! books are organized into color-coded levels. With the wide variety of titles featuring award-winning authors and illustrators, you can find books at every stage to engage and excite your child. We decided together it would be fun to make a dog biscuit recipe inspired by Biscuit from Biscuit Loves the Library. For many years Wes and I have enjoyed our kids in the the kitchen series, Mini Chef Mondays but lately we’ve fallen out of this habit. 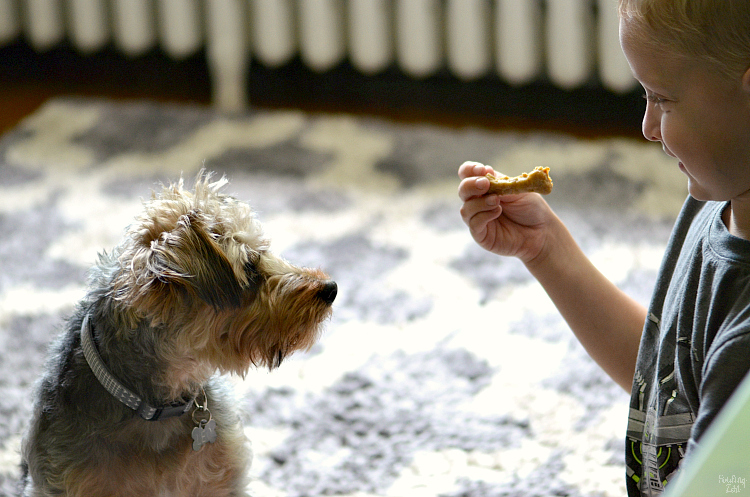 Making homemade dog treats was a great way to break up our morning spending quality time together doing something we love. 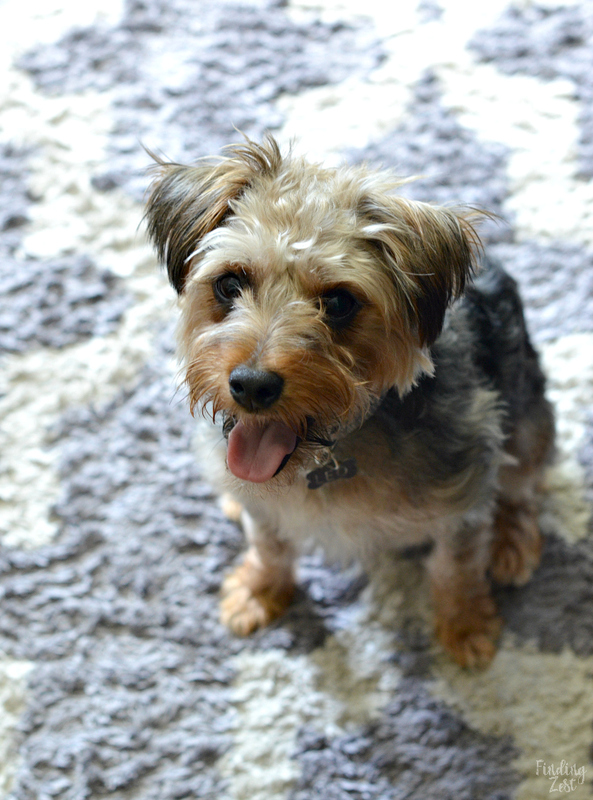 Our dog Leo was definitely keen on the idea of a homemade dog biscuit. 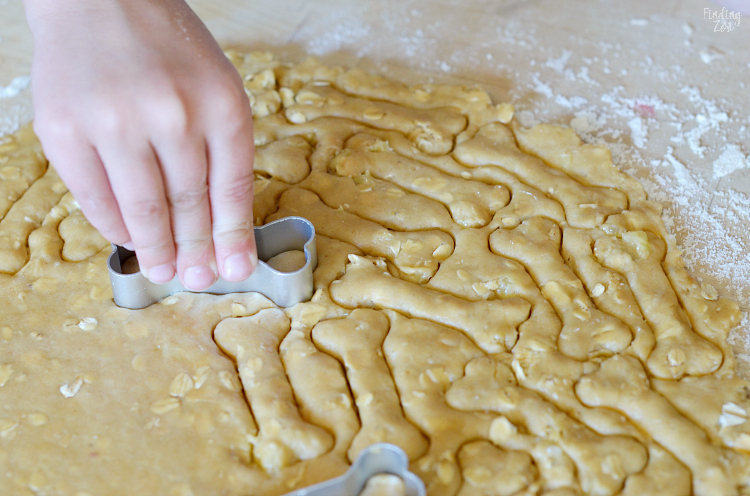 There are many different ways to make dog biscuits. 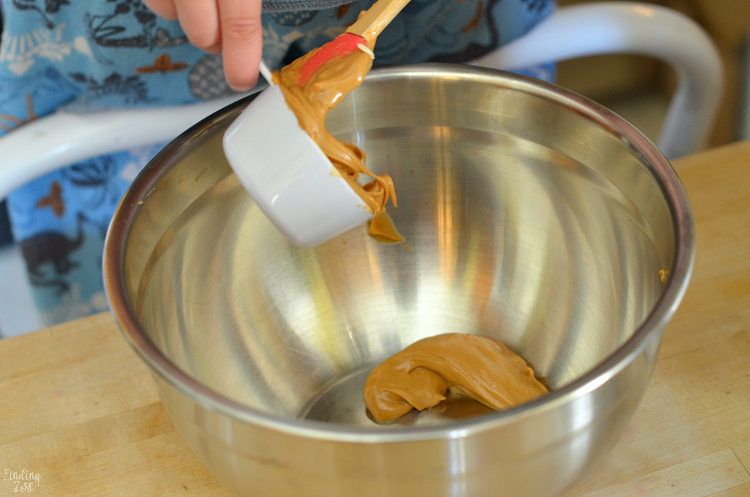 Most dog treat recipes call for either peanut butter, pumpkin or sweet potato. 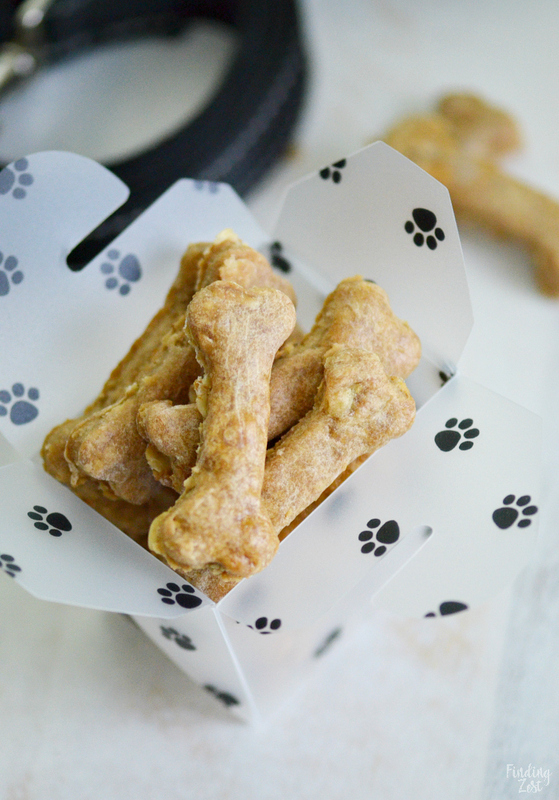 To match the color of Biscuit himself, we went with banana and peanut butter dog treats and kept the ingredients simple with what we already had on hand. 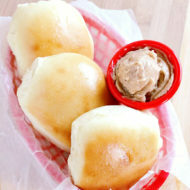 There are ways to make this biscuit even healthier such as with whole wheat flour but we didn’t have any on hand. 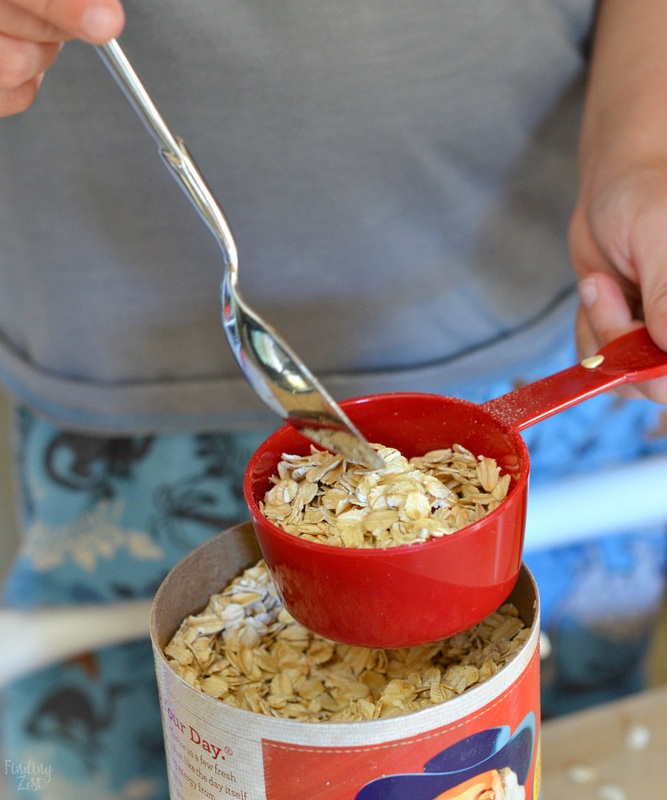 We thought oatmeal would be a nice touch and it made a great filler. 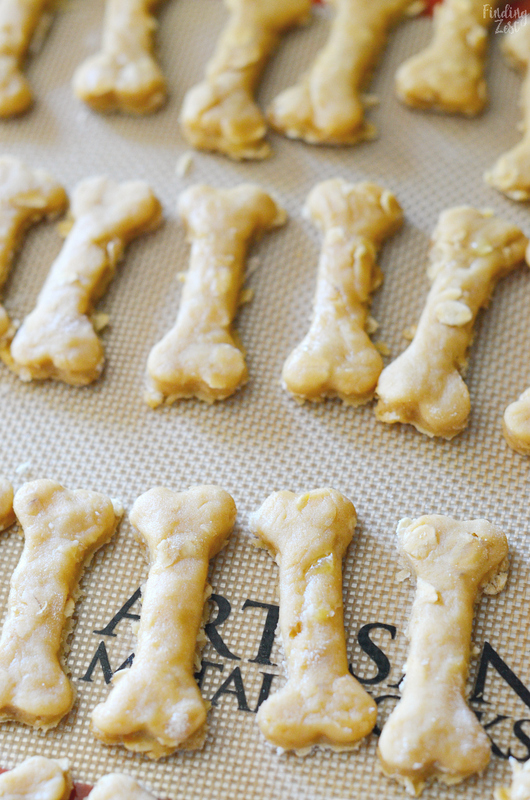 We used a mini bone cookie cutter for this dog biscuit recipe but you could use other shapes or even roll up the dough and cut them with kitchen scissors. 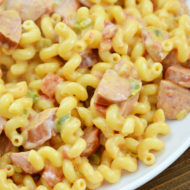 The main thing is to keep the thickness the same so your dog biscuits cook evenly. 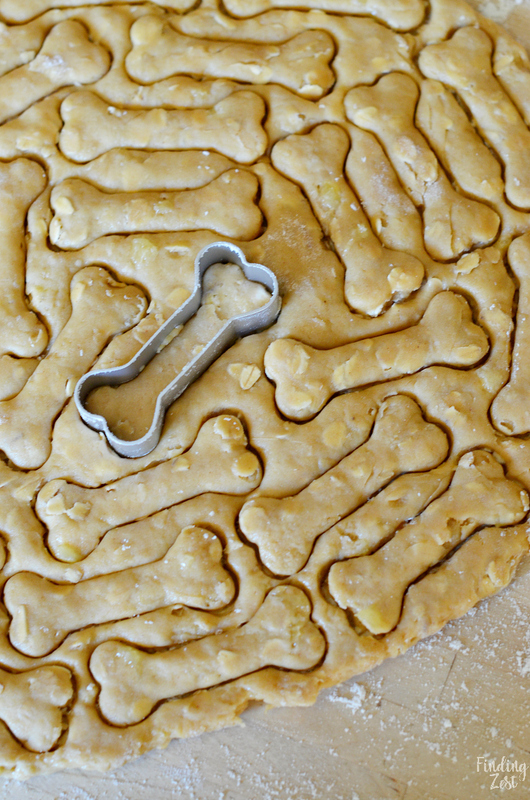 We baked our dog biscuits on a silicone lined baking sheet. This worked great to create a perfect biscuit bottom and avoid any sticking. 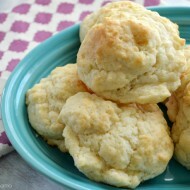 You’ll want to cook these on a lower oven temperature for a longer period of time to get that nice biscuit texture. Exactly how long will depend upon the thickness of your biscuits. I tried to keep mine about a quarter of an inch. And that is all there is to making a dog biscuit! Mix all ingredients except egg white in a medium bowl until well combined. Roll out dough onto floured surface to ¼ inch thick. 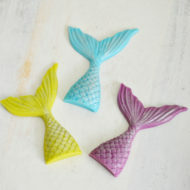 Cut into desired shape using small cookie cutter. Place on baking sheet and brush with egg white. 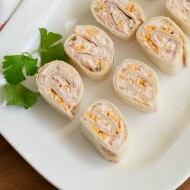 Bake until golden brown and firm, approximately 35 minutes, depending upon shape and thickness. Wouldn’t these make great gifts at the holidays? Leo absolutely loves them and Wesley couldn’t wait to give him one once they had a chance to cool. 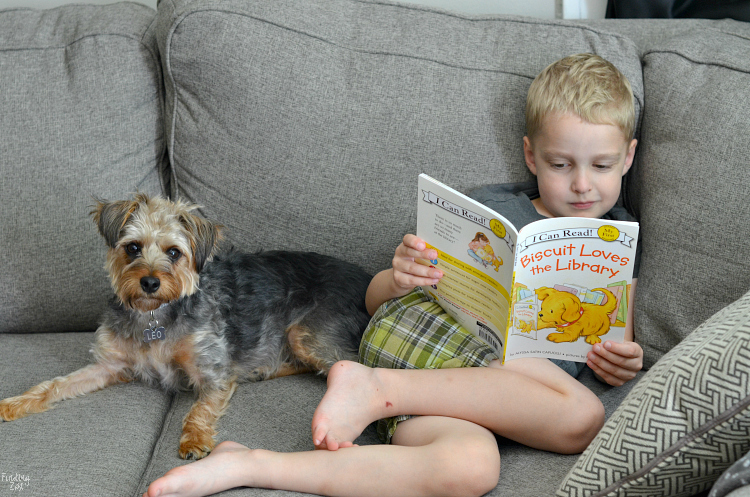 That afternoon Wesley spent some time reading his new I Can Read! books featuring some of his favorite characters including Splat the Cat and Paddington. He loves that he needs very little help with this series and can read a book almost entirely on his own. 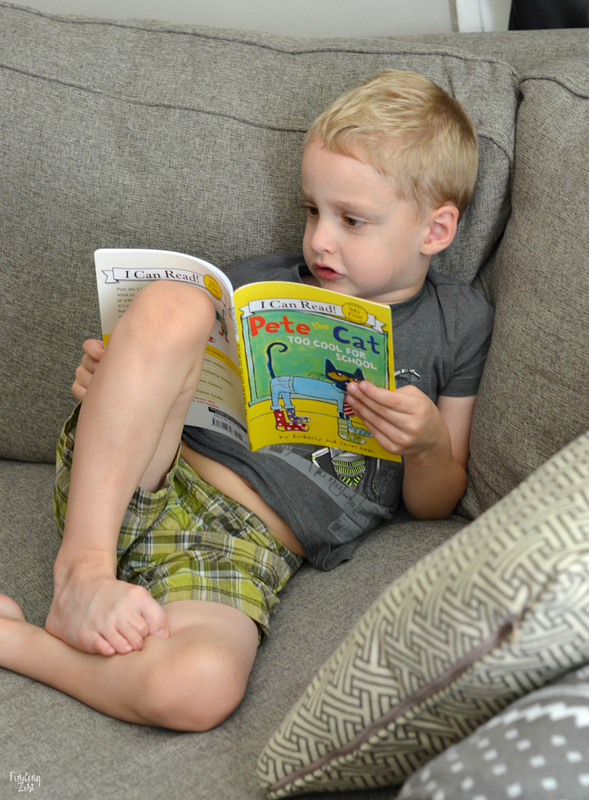 Watching him grow and continue to learn has been fun over this past year, especially with his reading skills. Besides Biscuit, Wesley was also super excited to see Pete the Cat. We have several Pete the Cat books on our bookshelf so Wesley was happy to add another one. 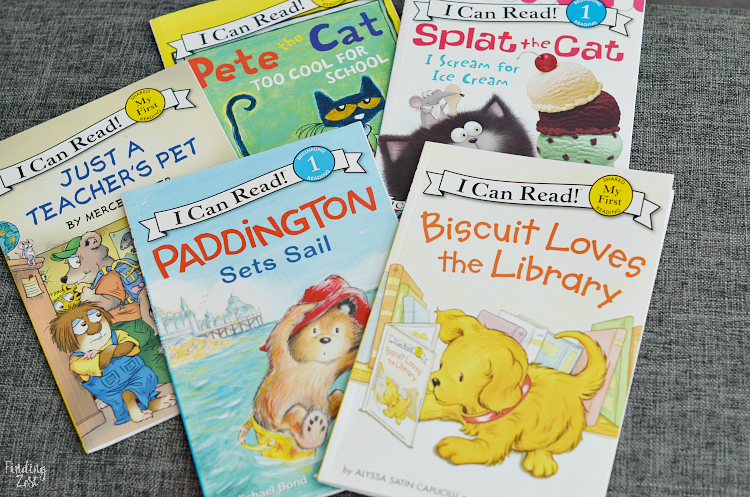 Click here for more reading tips, fun printable activities and download teacher’s guides for I Can Read! books. My boys love the Berenstain bears. FANCY NANCY is my favorite character. I’d have to say that Danny and the Dinosaur would have to be my favorite, with a close second of Frog and Toad. These were my two favorites as a kid. My children has these stories, and soon my grandson will too. Amelia Bedelia is my favorite! I love Splat the Cat. The BERENSTAIN BEARS are my favorite. Pinkalicious is my favorite. Her stories are always so cute. My favorite character is Biscuit. He is so cute. Fancy Nancy is my favorite character! Amelia Bedelia is the character that got my son to read. I love Little Critter. I remember reading those books when I was young. Pete the cat is my favorite. My son enjoys these books. My favorite character is Clark the Shark. Fancy Nancy looks like a fun character. I like Fancy Nancy because my 2 girls are big fans of her!